Ideally, a CDFI board helps govern the organization, attract resources, as well as maintain accountability to the target market. This poses extra challenges for board recruitment, as board members must have the ability to make management decisions while balancing the needs of the target market. In order to provide insight into board recruitment, FUND Consulting examined size and composition of CDFI boards. 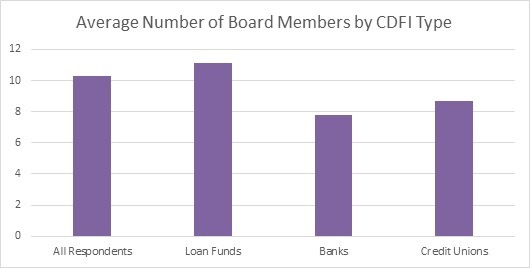 Based on our survey responses, the average number of Board members across all types of CDFIs is 10; the chart below depicts the variation by CDFI type. 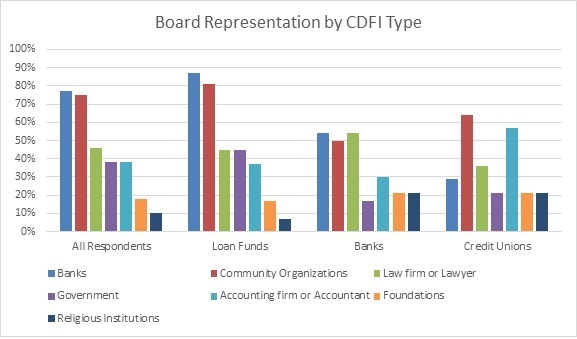 CDFI board members across all types are most likely to represent banks and community organizations. CDFI banks and credit unions are more than twice as likely to have representatives of religious organizations on their boards and far less likely to have government representatives when compared with CDFI loan funds. Will this board member help my CDFI meet the accountability requirements for CDFI certification? What resources can this board member bring to the CDFI? Will this board member be able to help introduce the CDFI to funders, investors, donors or potential partners? What skill set does this board member bring to the CDFI? Next week on the blog, we will present skill sets of CDFI board members. CDFI Boards and Fundraising: Week 1, An Introduction to FUND Consulting Research	CDFI Boards and Fundraising, Week 3: What Skills are Sought After on CDFI Boards?